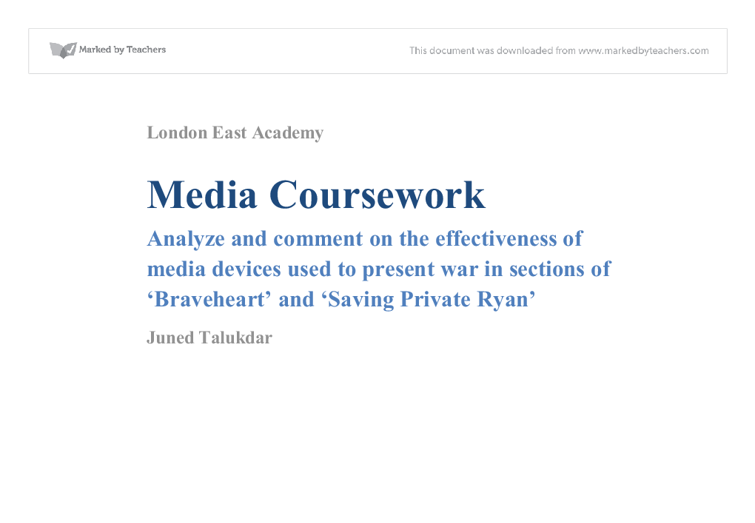 Analyze and comment on the effectiveness of media devices used to present war in sections of 'Braveheart' and Saving Private Ryan' Different media devices were used for effectiveness to present war in sections of 'Braveheart' and 'Saving Private Ryan.' In both sections of the films battle scene, it brings all reality into the living nightmare that took place. Brought back into life by Spielberg and Gibson, I will show how media devices are used to present war in the most realistic ways. I will discuss how the sections portray the characters, use of sounds, and the use of camera shots and how they contribute to the overall effect of the scenes. One of the movies I will be looking at is Saving Private Ryan. Saving Private Ryan is an action packed movie directed by Steven Spielberg. The 1998 multi Oscar winning film illustrates the struggle of a set of men on a mission to retrieve a soldier from the front line after the beach landings in France. The film is set on the coast of northern France during the Second World War. The actual date the events take place on is the 6th of June 1944. The lead role was played by Tom Hanks who take the character of Captain Miller, the leader of the mission. ...read more. In addition, When Captain Miller goes onto the beach a bomb explodes nearby him; the sound automatically changes and is apparent. The audience would be able to tell that he lost his hearing, as the sound is a bit muffled. Just like the underwater camera, the slow motion is slower and dramatic. When Captain Miller reels out of the water, he stumbles and falls. There is a large amount of varied camerawork during this scene. It begins with a close-up of Captain, Miller as he emerges from the sea before it cuts to jerky, sow motion shots of Millers shocked expression edited alternately with the horrors taking place around him Subsequently we witness the carnage and chaos from his perspective. This brings the audience more closer to the action and they are able to empathize what Captain Miller is feeling. Furthermore during the slow motion scene, the sound can affect the scene in terms of realism. The sound is slightly muted; nothing can be heard except for the explosions. When another soldier tries to get some commands from the Captain, the sound returns and the audience are dragged back into the loud, fierce conflict and for the first time, we can hear the soldiers' words above the loudness of the gunfire and explosions. The outcome of the slow motion sequence used in Saving Private Ryan was very effective in the sense that the audience was given an insight of the true horror of war and this could affect their emotions towards the movie. ...read more. The drawback of the fast paced editing sequence is that we, the audience don't always know what is happening. This can also maybe a strategy of the director, to make the audience more involved in the movie by making them figure out the storyline and the ongoing of the particular scene. In conclusion, both 'Braveheart and 'Saving Private Ryan' are awe-inspiring films which provoke many emotions, feelings and reactions using media devices such as slow motion scenes and camera angles and tricks. Spielberg and Gibson- the directors of the films engage the audience by the use of violence which creates suspense and tension. The techniques that make the sections of the films emotive and realistic are the closes up shots where people are scared and confused. I think that Saving Private Ryan is a very good film because it gives the audience a detailed insight into war and its effect on the people who are immediately involved. I also liked the Braveheart because I liked the story it was telling. Braveheart is a film with entertainment, history and passion. It's fair to say it's not just a movie but also a state of mind. It allows the viewer to enter the magical world of Scotland and become a rebel fighting beside the mighty Wallace. Both movies present war in the most effective way that the images are still vibrant in our minds. 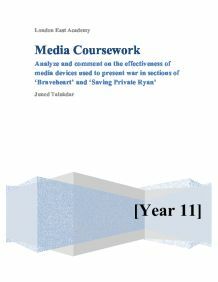 This is the effectiveness of media devices used to present war in sections of 'Braveheart' and Saving Private Ryan' ...read more. They go on in an agreeable conversation as Moore filters back to the conversation the things that Manson has previously mentioned. This indicates the film will become more interesting. The interior of the plane is all red which is very peculiar for an aeroplane. Red signifies danger so it specifies that things are going to become more interesting. The camera then has a close up of LL cool J.
back to his old home, and remembering what it was like to be young Stephen. The shift in tense shows his disorientation and loss of memory, also allowing the reader to follow his thoughts, trying to piece the mystery together with him, giving us active involvement in the development of the unknown, and keeping the reader hooked. forgetting the audience, all seemed to be wrapped up trying to release the devils inside Francesco. When it finished Francesco still was not cured and jumped into the bucket of water. The priest said that he could not be cured and they had to leave. He proves to the audience that he thinks this on page 162 when he says, "You wanted money, so I made money. Why must I be forgiven?". Although it is a great shame that Keller never faced up to his responsibilities I still think he was a tragic hero. For 'Charlie's Angels' the purpose is to attract teenagers to watch the film at the cinema. It does this by using specific elements that are in the film, such as comedy scenes or scenes of a sexually appealing nature to attract the largest audience they think they can. to the audience that he does not want to go with the villain and that he would rather stay with them. The Senators smile and then look at each other, the audience are left wandering what the Senators are thinking about as the camera then moves on. These types of scenes wouldn't just be that effective in achieving his objectives. By showing violence as individual acts committed against other individuals he makes it more shocking, confronting and deplorable. The audience receives this kind of violence as real and are affected emotionally.